When I heard about the V&A Museum's exhibition, "Fashioned from Nature," I immediately wanted to go, and last week I did. 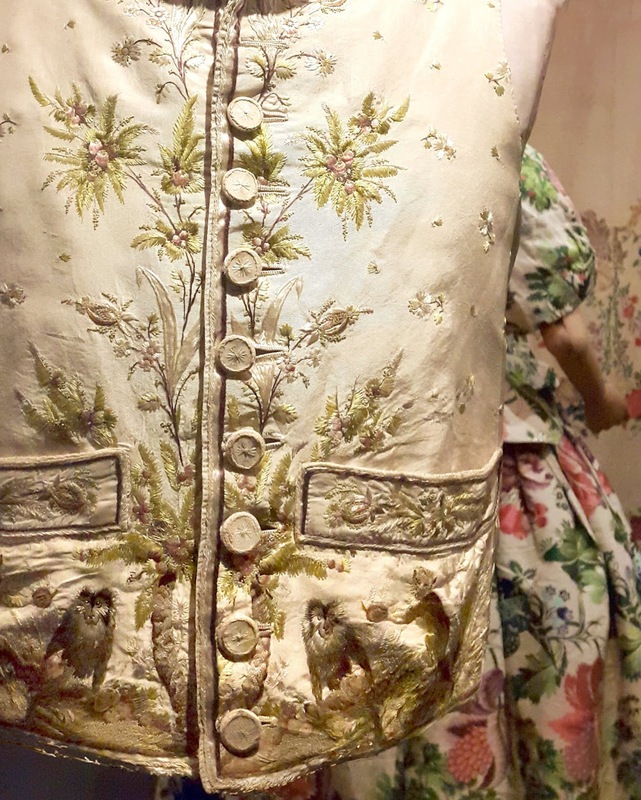 The show looks at how Western fashion has been involved with the natural world over the last four hundred years, and it takes in a huge variety of garments, from labourers' fustian smocks to gowns decorated with beetles - as well as quite the most awful earrings I have ever seen in my life. I won't try to tell you about everything, but it was good to see that many of the beautiful items on display were simply celebrating the beauties of nature. The embroidery on this evening dress from 1810 shows swirling vegetation and tree ferns, and is thought to have been inspired by exotic St. Helena tree ferns that had just been given to Kew Gardens at the time. And this 18th century fine French waistcoat is also a celebration of nature, with African plants and Colobus monkeys (shown at the bottom) which would have seemed very unfamiliar to Westerners. At least the Colobus monkeys weren't being made into fur coats. Along with the admiration for nature there has always been a seeming determination to plunder it, as we know, and any show on this subject will inevitably include quite a bit about fur, skins, pelts and feathers. 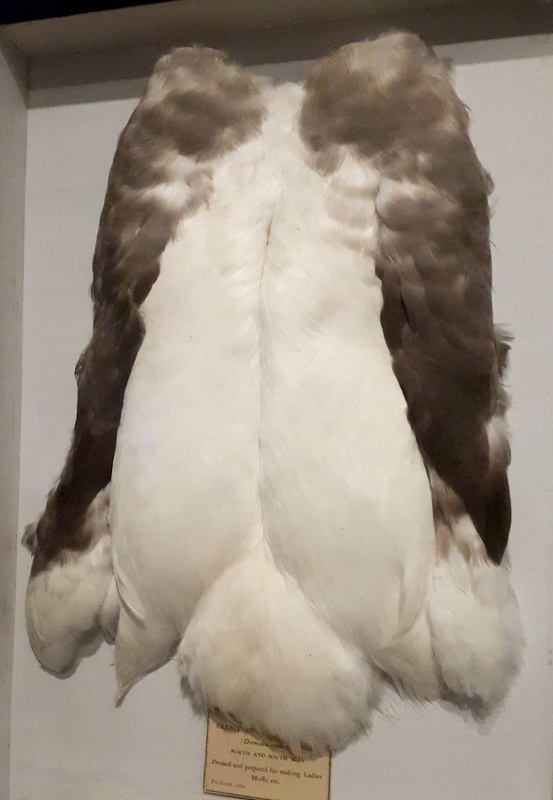 I found it rather depressing to admire the wonderful breast plumage of the huge albatross, only to see, (as the vintage label at the bottom said ) that this specimen had been "dressed and prepared for use in Ladies' Muffs, etc." I'll spare you a picture of those nastiest earrings I've ever seen - in fact, thinking about it, they are too nasty even to describe. So if you want to see them you must go to the exhibition and look at all the earrings and see if you can guess. There was something distasteful too about common birds which were "altered" to make them look into more interesting, expensive and imposing hat ornaments, although I know that DIY taxidermy appeals to some people. So I will move on to embroidery with beetle wing cases, as shown in the dress below. 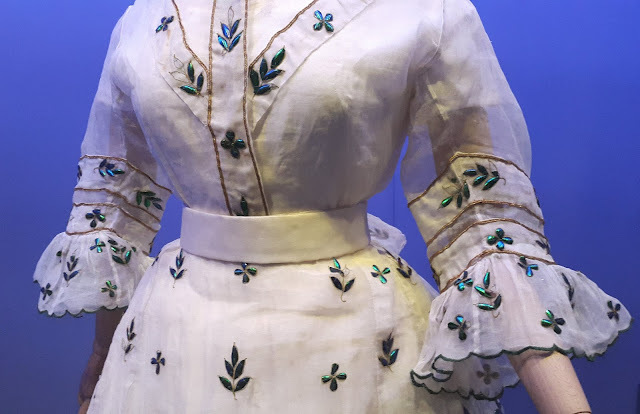 This was a type of white muslin dress that was often made in India for fashionable Westerners. It is stitched with iridescent dark-green beetle-wing cases of the jewel-beetle Buprestidae. This particular dress is relatively restrained: there's far more elaborate beetle embroidery on Pinterest. I believe the beetles discard the wing cases naturally, but these days you can get equally iridescent effects with certain types of sequins, although to be fair they don't look as if they are crawling all over you. The show has examples of all kinds of unexpected natural fibres which have been used in fashion. Forget about wool, linen and water-wasting cotton; I was more interested in more unexpected fabrics like glass and pineapple fibre. 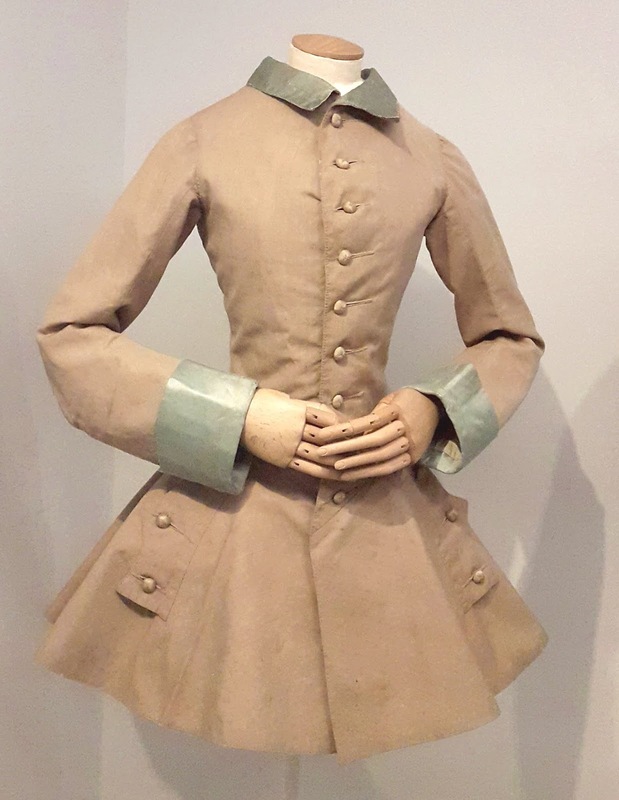 Pineapple cloth is now made on a small scale as a leather substitute under the brand name Pinatex, but there was a much more elegant and time consuming use of this tough substance in a wedding gown of 1820, in which pineapple fibres and silk were woven together. 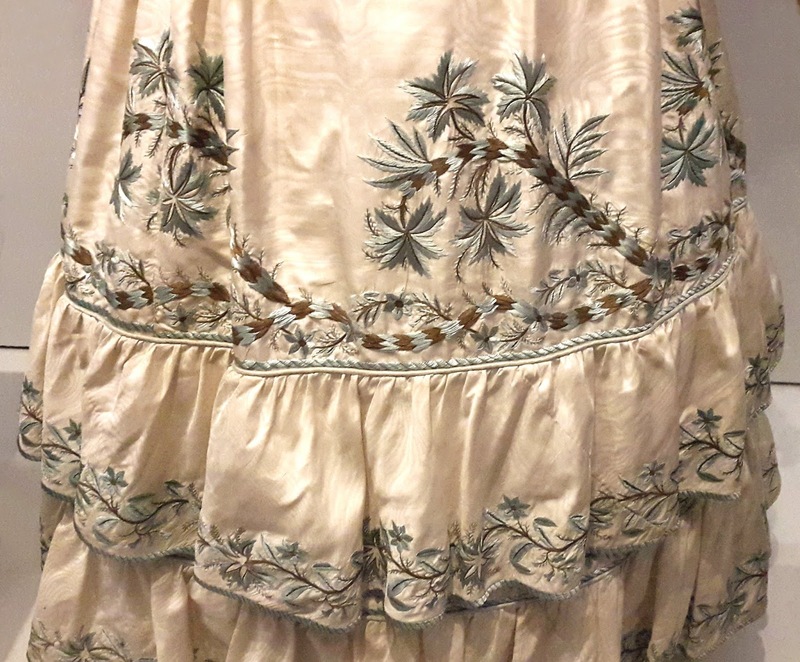 You might be able to see that the warp and weft of the silk was removed in part of the pattern, and only the see-through pineapple fibre remained. Environmental issues and exhibits are a significant part of the show. In the 21st century the major concern is the wasteful use of natural resources. There is so much throwaway fashion, and some of it, like cotton denim, takes incredible amounts of water to produce, so it is good to see that some major fashion companies are waking up to the idea of sustainability. Here is a link to H&M's "Conscious" range (click the little square beneath the description of each garment to read exactly how it is sustainable). At present, though, the idea of eco-fashion still seems like a bit of a fad, so it would good to see it become more mainstream. All so different from the second world war, isn't it? Then, just getting materials at all, of any kind, was a problem. 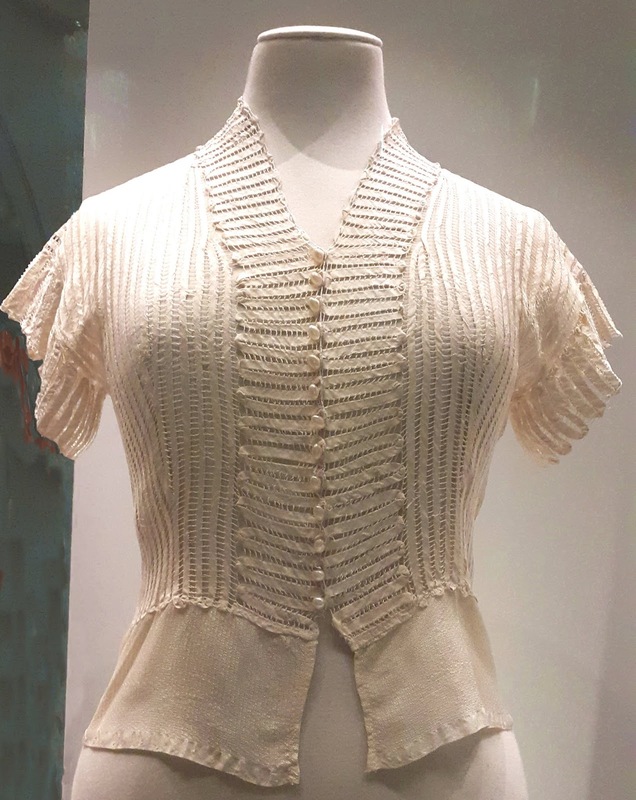 If you were a skilled craftsperson, though, you could create beautiful garments from used parachute silk, like this, fashioned by a clever London dressmaker in the 1940s. This might have been one of my favourite pieces in the show. Of course fashion comes up with all kinds of extraordinary ideas, and recent ones are just as impractical and probably just as uncomfortable to wear as that riding jacket. The shoes below are from the "Bird Witched" collection of Japanese designer Masaya Kushino. I found them very hard to photograph, so I've manipulated the image so you can get an idea of how they looked. 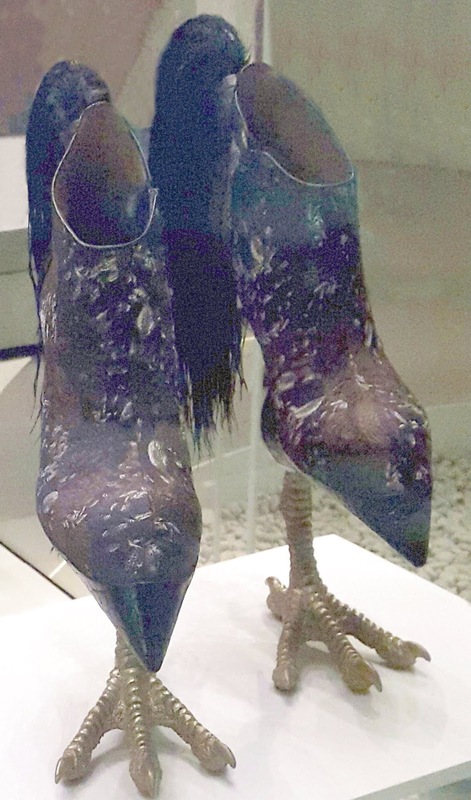 In real life, the shoes were black and grey, with black plumage feathers at the back, and sculpted metal bird claws which are the part you actually walk on. Since they stand several inches off the ground, anyone using them would need a wonderful sense of balance! Jean-Paul Gaultier, as ever, contributed one of the most amazing garments. 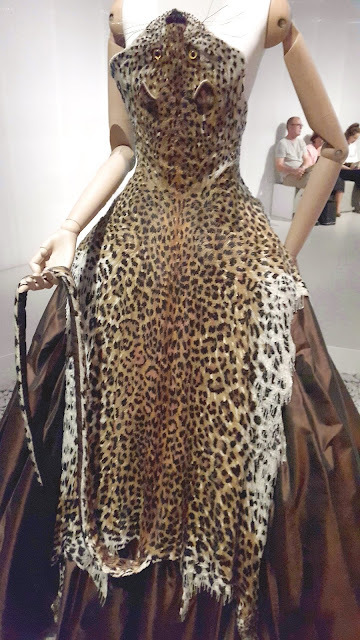 This dress, from his "Russia Collection" is called "Cat Woman," but in fact it depicts a leopard. It is not made from real leopard skin but is created with many thousands of beads, and the label said that it took over 1,000 hours to make. 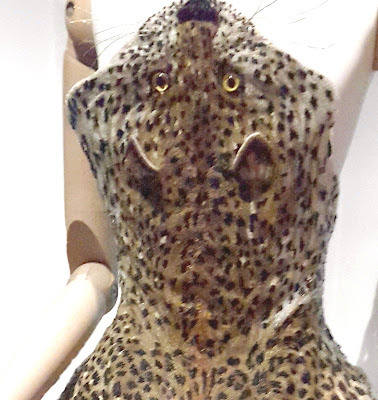 You will see that the "leopard" face forms the entire bodice of the dress, and to me it looked as if it was holding the model in a close embrace. A bit creepy, as so much of this fashion is - but for me that's one of the things that makes it so fascinating. After seeing the show, we emerged, blinking, to soak up some rays in the Madjeski Garden, in the museum's central courtyard. In the beginning, I suspect this garden with its calm lawns and shallow pool was originally intended as an oasis of serenity. Well, it's anything but that, now, and all the better for it. The museum seems to have decided that it should be a child friendly zone and added water jets to add to the fun, which I'm sure weren't there originally. 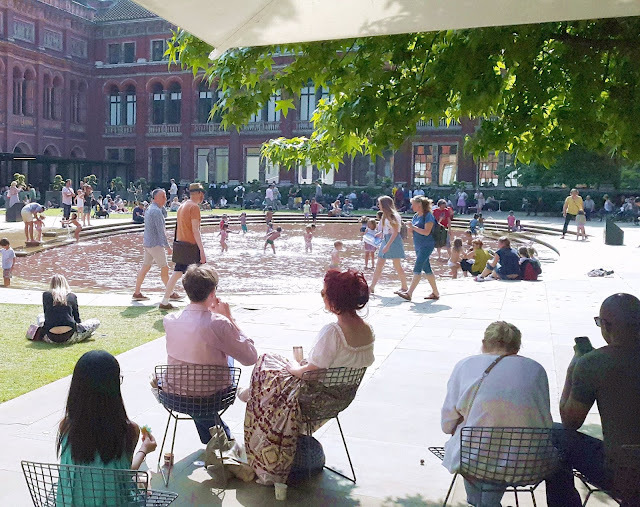 There's now even an an icecream stand in the sunniest corner, where you can sit and watch the kids play and notice everything that is going on in the square. On the way home, we stopped off by the Paddington Canal to see what was new. More children, more water jets. 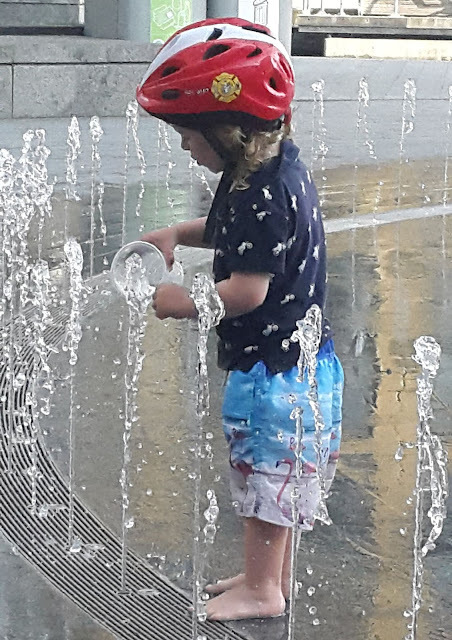 This little person below spent a while figuring how to catch water from the jets shooting upwards all around her. She was very persistent, and in the end she realised that her mug had to be right way up, catching the water as it fell. It may seem obvious to us, but I thought that was a real feat of reasoning for a little tot. I know that the weather in some countries is pretty bad right now, so I hope you're getting some pleasant summer days where you are. And, if you want to go to the "Fashioned From Nature" exhibition - which doesn't finish until next January - I do recommend it, and the details are here. Fashion truly can be art. I am not much of a wearer of fashion but I have always been fascinated by beautiful clothing of all sorts. I'm sure I would have loved this exhibit. Hello Jenny, It is always weird when clothing gets a little too biological. For example, I can understand how people of another time were attracted to fur clothing, but those fox stoles with the heads and feet attached were just plain creepy. I also remember the key chains made from real "lucky" rabbits' feet! Not so lucky for the rabbit, I always thought! Interesting post, thank you. Hats made with dead birds on them has to be next to those earrings you post about. The beetle casing's dress in the top ten as well. Nowadays fabric is made so poorly, renovating vintage clothing feels like a better idea than make clothes from new fabric. The amount of link and pilling is unbelievable in today's clothing. 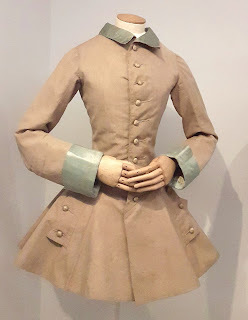 Today's clothing is mostly made pretty cheaply to be fashionable, and is often discarded after a couple of wearings, or so the exhibition said. Wow - the "Fashioned From Nature" exhibition" is really fascinating. When I see garments like that 1810 evening dress I wonder how (or if) they were ever washed. I'm also wondering if that tiny riding coat was perhaps made for a child? Those bird claw Japanese shoes are fantastic (creepy, but fantastic). I would love to see somebody try to walk in them. Trying to run would be even more amusing. I don't like the Cat Woman garment at all. I thought the tiny coat might be for a child except that it was so wide at the shoulders, it was completely weird and more so than the photo suggests ... Yeah, best to not know about the earrings! Creepy certainly... but mostly I loved the craftsmanship. Thank you. I love fashion history. Seen from a waste/conservation perspective is important. Have you seen any of the Amber Butchart Stitch in Time series? No, I haven't. I looked them up and they look fascinating. They're on Youtube. I'm going to watch. Thanks. Oh dear me, those fashions are really creepy! Love the little one figuring out how to get the water in the cup. Greetings Jenny! This was a most interesting post and if I were not so far away, I think I'd try to see that fascinating exhibit. I cannot believe those Japanese bird shoes - wow. It would be rather creepy seeing someone walking towards me in those shoes I think. 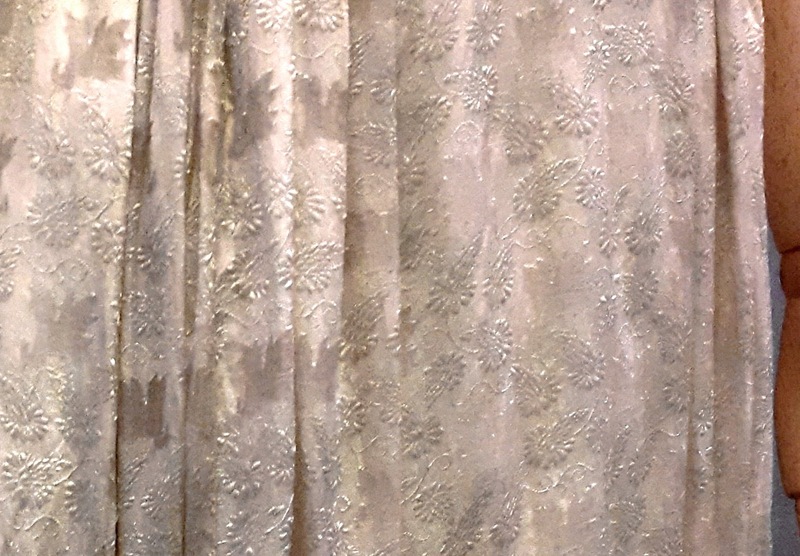 I loved the silk/pineapple fabric - so sumptuous looking. Thank you for sharing. You first caught my attention with the mention of those "awful earrings" but after what you said about them later in the post I'm glad you did not show them to us. Have a lovely weekend over there in London. I went to see the film about Alexander McQueen's life history last night, very interesting. Fashion is indeed a world of its own but to me somehow rather a frightening one because so intense. I have visions of getting on an escalator in the 'claw' shoes and not being able to get off again. Some interesting fashion fashion in your collection. 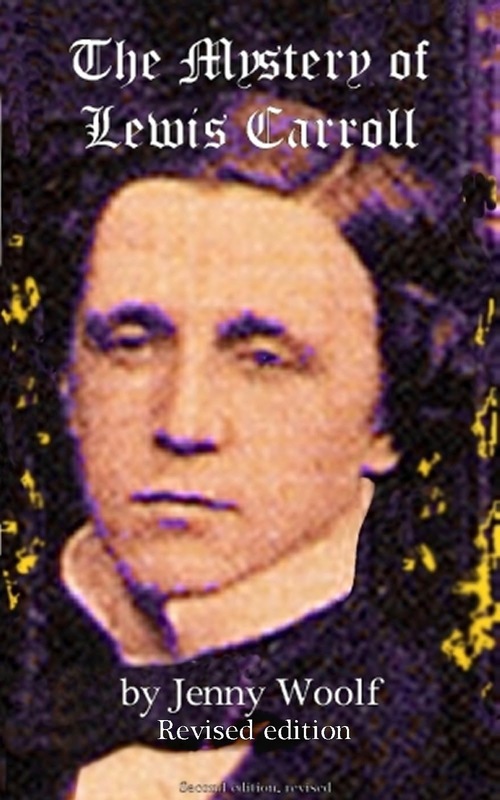 The parachute silk. I wonder if the skinny riding coat was for a child. With extraordinarily long arms. Sometimes i wonder what species these designers are making clothing for! That leopard dress is dramatic but not something i'd want to see on a person, and the same with those bird shoes. I think some of the clothing was really better understood as works of art, I should think the shoes were impossible to spend more than a few minutes in unless you were a professional acrobat! Interesting stuff...and whenever I see fashion like this, I'm always happy I wasn't born during the time when this fashion was popular. Anything frilly, complicated, fussy, or uncomfortable would drive me up a wall. I'm a big fan of plain pants and shirts. 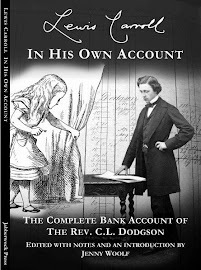 I would have been driven nuts by long skirts, I am reading a book in which a woman born in 1870 remarked that it made her arms ache to see rain because it made her think about constantly having to carry her wet skirts over her arm. Yuk! I must look into the pineapple fibres for use in fabric weaving. The last time i was in the garden at the V and A there was a festival of central american dance. Must have known i was coming. What a great reason for a trip to London! I felt a bit poorly looking at the clothes made from animals and I couldn't even begin to understand who would wear boots with claws. Times might have changed but at least we now have things made from plastic!!! I am told that we might have warm sunshine next week.... I can't wait. The claws were not real, they were sculptured from metal, but I know what you mean! Imagine walking around with great metal claws on your feet though!!!!!! You have made me all curious about the nastiest earrings you've ever seen, Jenny! The V&A is such a great place, always guaranteed to feature unusual exhibits or looking at everyday things from a different angle. I had got the photo ready to go on but then decided I really didn't want them on my blog! I have never seen monkeys on dress. In those days exisotic designs must have attracted people. In those days the monkeys were newly discovered by the west and seemed very strange and exotic. Never been to the V & A, but want to go now after your description. I love watching the wee ones running about in the water spouts, learning every second. Yes, it's well worth a visit, all kinds of stuff there, some of it in great big exhibitions and some tucked away in corners. What a fascinating exhibition. The photos were very good. So pleased that dress wasn't real leopard's skin & those shoes with the claws, unbelievable! I haven't visited the V&A for 50 years. One of these days I must go back. Thanks for the virtual visit. The V and A has always been in the forefront but I think it must have changed in 50 years so worth a return visit by now!!! interesting Fashion show in V&A museum. I like this museum and its square with a lovely fountain. I love the dress with green plant embroider, the white one. I think now we're very practical in our wearing and forgot how to wear hand made things. The last photo is amazing! It must be so difficult to look after that beautiful clothing. I am always careless and spill things etc. so I like to wear practical clothes. I think a lot of people do embroidery but perhaps many young folk don't have the time to do it as a hobby, which is sad. For earlier generations of women, sewing was a big part of their day. Some wonderfully ingenious garments there. And yes, the enormous time and patience that must have gone into some of them. A thousand hours to make a dress! Goodness knows how anyone could fit into that riding coat - except with a ruthless corset as you suggest. Wow! That was absolutely fascinating, and I'm sure even more so to see in person! Thanks for visiting and commenting on my blog. I will for sure to be back to visit yours again. Would you consider putting up a "subscribe by email" box? That way you get notified of new posts. I tried to subscribe to your blog by email but the link goes through to a page of HTML. I hope mine doesn't! Oh Jenny, I'm so glad this goes until January! V&A is on our itinerary and I'd love to see it (and see if I can guess the disgusting earrings, too!) Some of those outfits are extraordinary. I suspect the weather won't be so nice for a sit by the fountain time in October, but maybe...! I love every photo -- and good for you with the camera. It did fine! Oh, yes, do visit, Jeanie. I wonder if you will spot the earrings. Somehow they just appalled me. And, who knows, you might be lucky with the weather! As a sewer and knitter and occasional embroiderer this show would fascinate me. I love how you've brought us there. I remember my grandmother telling me she had achieved the feat of having a waste of 16" when she was 16. Much whalebone and casing and ties at the back, she said she couldn't eat as it would hurt. I particularly love the embroidery and the parachute piece. I often wonder what it did to those womens' bodies wearing corsets that constricted them in that way. Now, I see those crippling clothes as a kind of oppression of women, because they did stop them doing all kinds of things. Even studying was difficult I think - bending over and writing and studying, specially if they were short sighted. The leopard one is indeed creepy, but the fabrics and cuts of the other clothes are just gorgeous. For me that was one of the more bizarre exhibitions. I think the shoes were the most bizarre. Mmm maybe. But then you didn't see the rest of the show ... LOL!! Thanks for sharing, Jenny Woolf. Art for art’s sake – ingenious and useless at that. On the other hand, why not? Thank you! Love your website, even though I don't speak Russian! "Fashioned of nature" it is such an interesting exhibition.I like the evening dress ,especially that skirt! The leopard dress is wonderful. I admire its sense of humor to create the dress. Your post opened my eyes. Nature have been used for fashion motif in various ways. A little girl in the last photo! Have a good day,Jenny and T.
Dear Jenny - Patterns in nature is inexhaustible. I’m not really a fan of animal print even if made of beads but love floral print, especially Liberty or William Morris print. A couple of my favorite summer blouses are made by their fabrics. Too slim riding coat made me laugh. The bird-feet-shaped boots feels weird and looks uncomfortable, but idea is interesting, I think.